Beaphar White Dog Shampoo is a PH-neutral shampoo with a fresh smell of passion flower that has been specially formulated for all white and light haired dogs. This cleansing shampoo will leave your dog smelling clean and fresher for longer and will help keep their skin moisturised and their coat soft and shiny. 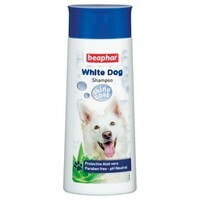 Beaphar White Dog shampoo is a mild shampoo containing Aloe Vera and Camomile that is also suitable for dogs with sensitive skin.